Andrew Luck is nearly a month into his first NFL offseason, yet he can’t seem to get away from football. Earlier this week, Luck threw a game-high 205 yards and two touchdowns at the Pro Bowl. Now, the Colts signal caller is making the rounds at Super Bowl XLVII in New Orleans and sat down with Adam Schein and Rich Gannon on ‘The SiriusXM Biltz’ to recap his rookie season. “It was a lot of fun especially just to be in the thick of things come December,” Luck said on radio row. “It was fun for our draft class, T.Y. Hilton, LaVon Brazill, Vick Ballard, the tight ends to be able to contribute. The blend of youth and experience was managed just right to place the Colts back into a familiar state of taking part in meaningful games during the month of January. “From the veteran side, I think they were so accepting of us and accommodating and would take time out of their day to maybe show us ‘don’t do this, or you don’t need to be going over here,” Luck said. Luck admitted that he is having trouble trying to ‘digest’ everything he experienced during his rookie campaign. An 11-win season came after dealing with numerous unforeseen circumstances that only added to the impressive debut by Luck. When Dwayne Allen was growing up in Fayetteville, N.C. he thought his future would be on the hardwood. Allen grew up as a bruising post player on the basketball court and it took until his freshman year of high school to realize that his physicality could be channeled elsewhere. It was then that Allen picked up the pads and embarked on a high school career that would place him among the nation’s top tight ends. The love for basketball has not disappeared for Allen and in his new home of Indianapolis he has found a new favorite team in the state capitol. In witnessing a 64-63 Butler buzzer beating victory, Allen went as far to say Hinkle Fieldhouse was ’10 times louder’ than what he experienced during the Colts 30-27 victory over the Packers. Allen’s affinity to Butler began with his high school team sharing the same Bulldogs nickname. The Colts rookie tight end loves the coaching style of Brad Stevens and even owns his own bulldog. In less than a year, Allen has been embraced by the Indianapolis community and has returned the favor as one of the most frequent community visitors on the Colts roster. Indianapolis is Allen’s new home for the foreseeable future and No. 83 could not be any happier to call it just that. “The people here in Indianapolis and that (Colts) organization is unbelievable, great people,” Allen said. The Indianapolis Colts today hired Hal Hunter as the team’s assistant offensive line coach and Tim Berbenich as offensive assistant. Hunter holds over 30 years of coaching experience, including the last seven seasons with the San Diego Chargers. In 2012, he served as the team’s offensive coordinator/offensive line coach following five years as the offensive line coach and one season as assistant offensive line coach. Last season, Hunter’s offense featured quarterback Philip Rivers who threw for 3,606 yards and 26 touchdowns, marking his fifth consecutive season with 3,500-plus passing yards. Wide receiver Malcom Floyd also established his second-best receiving total for a single season with 814 yards while contributing with five touchdowns. Under Hunter’s guidance, the Chargers offensive line garnered eight Pro Bowl selections, while blocking for three Pro Bowl running backs. From 2006-2012, the Chargers averaged 1,843 rushing yards per season and scored a total of 119 rushing touchdowns, which ranked second in the NFL during that span. In addition, the line ranked ninth in sacks allowed during that timeframe. Prior to joining the Chargers, Hunter spent 24 years coaching at the collegiate level, including a two-year stint as offensive coordinator at Indiana University where he guided Big Ten Player of the Year, Antwaan Randle El. Hunter also coached at Louisiana State University where he served as assistant head coach in 1999. His other collegiate coaching stops include North Carolina (2002-05), Vanderbilt (1991-94), Akron (1987-90), Indiana (Pa.) (1986), Columbia (1985), Pittsburgh (1983-84) and William & Mary (1982). Hunter’s father (Hal Sr.) was the offensive line coach for the Colts from 1982-1984 and also served as the team’s interim head coach for the regular season finale of the 1984 season. Berbenich possesses nine years of NFL coaching experience, including six with the Tampa Bay Buccaneers. With the Buccaneers, he served as the assistant wide receivers coach (2009-11), assistant running backs coach (2008) and offensive quality control coach (2006-07). In 2008, the Buccaneers running backs totaled 1,837 rushing yards, led by Pro Bowl running back Warrick Dunn. In Berbenich’s first season working with the wide receivers, he helped Maurice Stovall and Sammie Stroughter achieve career-highs in receiving yardage. In 2010, he tutored a group of wide receivers that featured four rookies, including Mike Williams, who led all rookie receivers in the NFL with 65 receptions for 964 yards and 11 touchdowns. The Indianapolis Colts today signed wide receiver Jeremy Kelley to a Reserve/Future contract. Kelley, 6-6, 230 pounds, played for the Utah Blaze of the Arena Football League last season, where he appeared in eight games, making 19 catches for 231 yards and seven touchdowns. Prior to joining the Blaze, Kelley played one season for the Hamilton Tiger-Cats of the Canadian Football League in 2011, where he recorded two receptions for 15 yards while also serving on special teams. Kelley played four years for the University of Maine and tallied 13 receptions for 148 yards and a touchdown. He also saw action on special teams and returned one punt for 10 yards. Like any kid going through school, Dwayne Allen is hearing the voice of his mother. Allen, 22, is taking online courses at Clemson University in an effort to complete his degree, a task that is being closely monitored by the woman who raised seven children with her youngest in the NFL. “Really Mom, ‘How’s my homework doing?’ Allen joked. After leaving Clemson with one year of eligibility remaining, Allen found success in the NFL leading all rookie tight ends in catches (45) and receiving yards (521). Allen said he is still in the planning mode on where he will train this offseason with Indianapolis as an option. One place that Allen is sure to stay away from during his break from the playing field is Dairy Queen. During the regular season Allen said he would treat himself to a blizzard following victories but that will be put on hold in an effort to improve his stamina over the next few months. “I play (basketball) to keep that cardio up and my weight down because if I’m not doing anything that weight will add up quick and I’m already a big guy at 255-260,” Allen said. This weekend Allen will hop on a plane and head to Columbia, S.C. for a chemistry test he will take on Monday. The main goal away from the gridiron this offseason is to graduate, and he can thank the woman who has helped him achieve his dream of playing in the NFL for that. “I want to get that done,” Allen said. When you hear Robert Mathis, a four-time Pro Bowl choice say, “we needed a leader and we had heard lots about Andrew Luck. He gave us all that we needed and more,”. Combine that statement with the praise given to Luck by a man who has played more than 170 career games, the great Reggie Wayne, then you can feel the growth of our new era. Amongst men that have been and probably still are his idols, Andrew Luck at the Pro Bowl conducted himself as a seasoned career professional and made every Colts fan proud of what we have growing in Indianapolis. If you are a patriotic Australian you are said to be “TRUE BLUE”; well, that works two ways for this true blue guy and I thank everyone who has contacted me stating they are enjoying my Aussie point of view. So it is with some curiosity that I observe what has happened to Manti Te’o. The poor guy has been the VICTIM in what can only be described as a form of cyber bullying. He got set up, possibly a college prank and that’s obvious to a blow in (new comer) like me. If he is guilty of anything, he is guilty of being a trusting person who felt compassion for another’s plight – that’s all the poor guy is guilty of; there is nothing shonky about Manti Te’o who is a very talented and honest young man. So, blow me down, how does that affect his NFL Draft? You can only hope that the media don’t beat up on this person for simply accepting something on face value. I’m on the other side of the world and can see what has happened so cut the kid a break. So this Sunday, I’ll be buying all the ingredients for SUPER BOWL MONDAY! Weird, hey. No I won’t be twenty four hours late, it’s just that International Dateline stuff. But who will prevail? I don’t mind ‘cause the Colts aren’t there so I’ll just enjoy the football, But one of my clients said, “Come on Doc, that’s a cop out. Who do you reckon will win?”. If I had to place a bet, I think Flacco and the Ravens will be hard to beat if the 49ers fail to cover Joe’s deep plays. But if you reckon different, I won’t pick a blue (fight, argument) with you because it just ain’t the BLUES turn this year. But it will be….it will be. Hope you all have a great Sunday in Indianapolis or wherever you might be and enjoy the battle on the gridiron! Indianapolis Colts General Manager Ryan Grigson has been named The Sporting News NFL Executive of the Year. The award was voted on by coaches and executives around the league. After the Colts finished the 2011 campaign with a 2-14 record, Grigson was hired on January 11, 2012 to build a coaching staff and roster that would return the organization back to its winning ways. Grigson saw immediate success in his first year, constructing a team that finished the 2012 season with a nine-win improvement, which is tied for the third-largest one-year turnaround in NFL history. The Colts also became only the second team in NFL history to win 10-or-more games after losing 14-or-more the previous season as the team reached the playoffs. Just weeks after accepting the general manager position, Grigson, in conjunction with Owner & CEO Jim Irsay, selected Chuck Pagano to the lead the team as the next head coach. After hiring Pagano, Grigson signed several key free agents that featured a mix of veteran leadership, experience and depth. He brought in defensive end Cory Redding, nose tackle Brandon McKinney and safety Tom Zbikowski, who all played under Coach Pagano in Baltimore. Grigson made additions to the offensive line having acquired tackle Winston Justice in a trade and signing center Samson Satele and guard Mike McGlynn. Also on offense, he executed a trade for quarterback Drew Stanton and signed wide receiver Donnie Avery. Along with acquiring new players, Grigson also re-signed core veterans in wide receiver Reggie Wayne and outside linebacker Robert Mathis, both of which were selected to the 2013 Pro Bowl. Wayne recorded one of the best seasons of his 12-year career, posting 106 receptions for 1,355 yards and five touchdowns. Mathis registered eight sacks on the year and intercepted his first career pass, while adding 51 tackles (31 solo), two passes defensed and one forced fumble. In the 2012 NFL Draft, Grigson selected four players that became regular starters on offense in quarterback Andrew Luck, tight ends Coby Fleener and Dwayne Allen and running back Vick Ballard. Wide receiver T.Y. Hilton started one game last season as well. Among several Colts and NFL milestones, Luck broke the NFL rookie single-season record for passing yards (4,374) and 300-yard passing games (six). Allen set a new franchise record for the most receptions (45) by a rookie tight end. Hilton led all NFL rookie receivers with five 100-yard receiving games, despite being the 13th receiver selected in the draft. Luck and Ballard led the team in passing and rushing, which made the Colts one of only three teams in NFL history to reach the playoffs with rookies leading the team in those two categories. In addition, the Colts rookie class accumulated the most total scrimmage yards (3,108) in a season since the 1970 merger, breaking the previous NFL record set by the Colts in 1999. With limited money to use in free agency, Grigson had to get creative on bringing in new players. He facilitated seven trades last season, bringing in five players who started at least one game (Winston Justice, Cassius Vaughn, Moise Fokou, Josh Gordy and Vontae Davis). Grigson also signed players from different leagues, including the AFL, IFL, UFL and CFL. Inside linebacker Jerrell Freeman came from the CFL and in his first year, broke the Colts single-season record for tackles with 203 stops last season. On defense, two cornerbacks who were not on the team last year led the Colts in interceptions in Darius Butler (four) and Vontae Davis (three). Butler was signed on September 25 after being waived by the Carolina Panthers prior to the start of the regular season, while Davis was acquired in a trade with the Miami Dolphins on August 26. The Colts used 68 different players this season as the team was forced to place 13 players on Injured Reserve, including five who started games (Donald Brown, Robert Hughes, Fili Moala, Drave Nevis and Jerraud Powers). The 13 players on Injured Reserve totaled a combined 53 games played and 24 games started. Four players on the Colts roster were activated off other teams’ practice squads, including three rookies (Nathan Palmer, Bradley Sowell and Delano Howell) and one second-year player (Lawrence Guy). 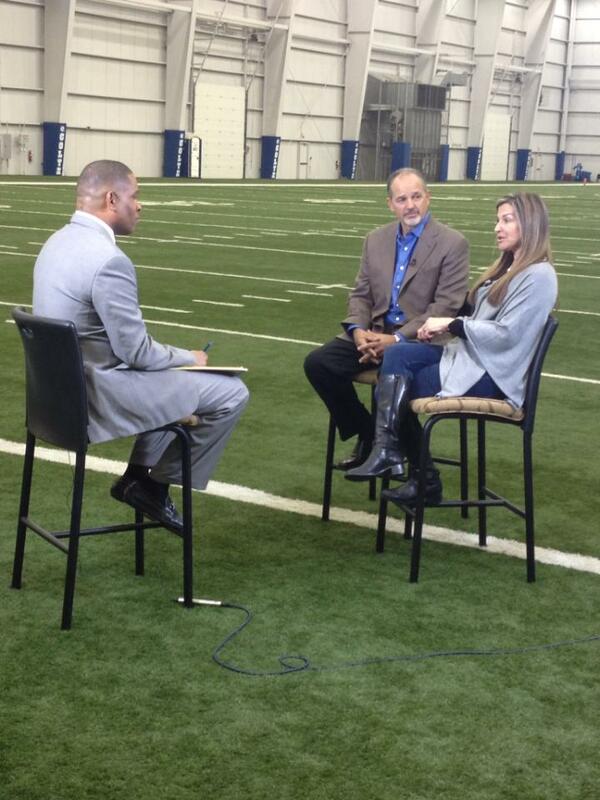 Chuck and Tina Pagano discuss what they’ve dealt with over the last four months with WISH-TV’s Anthony Calhoun. The Pagano’s sat down with the four local televisions on Thursday afternoon. Exactly a month since his return to doing what he loves, Chuck Pagano was back in the Colts indoor practice facility on Thursday afternoon reminiscing about a year that can hardly be put into words. Pagano was joined by his wife, Tina, in speaking to the four local televisions about what the two endured over the past four months. It was mostly smiles on Thursday, with the couple feeling ‘blessed’ to have their life beginning to feel as close to normal as it can. Both were brought back to Wednesday, Sept. 26th when Dr. Larry Cripe informed Pagano that he was being diagnosed with acute promyelocytic leukemia. Tina talked about how both her and Chuck were put at ease once Dr. Cripe spelled everything out and used the word ‘curable’ in describing the fight that was ahead. The hardest part for the couple came when the time arose to inform their three daughters of Chuck’s illness. Once Chuck called his daughters to let them know what he was dealing with, it was time for the fight to begin and it would not happen without Tina being there every step of the way. In those 25 days, Chuck and Tina spent a couple of Sunday’s together watching the Colts. It was something neither was used to and the two shared a few laughs on Thursday afternoon when discussing Tina’s energetic demeanor during the game. During the Green Bay game on Oct. 7, Chuck said the game wasn’t even a possession in before Tina was on the edge of her seat, raising her voice in support, a scene that her husband was going to have to deal with for the next few weeks. “I said to her, ‘Are you kidding me? This is how it’s going to be for three hours,” Chuck said with a smile while looking at his wife. The two wanted to thank all the support they received from the Colts organization and a community that welcomed them in from day one. “For them to embrace our family…without them, I wouldn’t be sitting here now,” Chuck said. When Ryan Grigson is building the backend of his 53-man roster, he is looking in particular at one specific unit. Special teams was a priority that Colts Owner Jim Irsay pointed out to when hiring a new general manager and head coach a year ago this month. Back during the summer, Grigson said that putting together a formidable special teams unit was something he ‘strived’ for and that was evident with its success this season. “There’s an alert that’s next to the grade on the back end of the grade and it’s an alert that shows the player that has the makeup to be a core special teamer,” Grigson said in evaluating his roster. In the return game, the Colts broke a pair of touchdowns in the second half of the season and seem to have found an electric punt returner in T.Y. Hilton. The big play ability of Hilton was a focal point offensively, but that trait also carries over to the return game. “In terms of the draft I think we showed that by trading up to get T.Y. (Hilton),” Grigson said of the team’s diligence to address special teams. While Hilton began to receive a lot of attention near the end of the season, Grigson also wanted to point out the Colts punt coverage unit that included gunner Joe Lefeged. Despite having to slide over to punt protector late in the season, due to an injury to safety Tom Zbikowski, Lefeged still led the team with 16 special teams tackles. Along with Lefeged, gunner Sergio Brown (10 special teams tackles) excelled on the punt coverage unit. Grigson feels that new special teams coach Tom McMahon has the pieces in place to build a strong special teams unit with plenty of depth for years to come. Indianapolis Colts wide receiver REGGIE WAYNE was named the offensive captain for USA Football’s 2012 All-Fundamentals Team through a national fan vote conducted Jan. 7-21. The fourth annual USA Football All-Fundamentals Team, which honors 26 NFL players – 11 offense, 11 defense and four special teams – recognizes NFL players who exhibit exemplary football techniques for youth players to emulate. Playing fundamentally-sound football fosters better on-field performance and inherent safety benefits. More than 10,000 fan votes were cast via www.facebook.com/usafootball to determine the team’s three captains – one for each phase of the game. Joining Wayne as captains are Chicago Bears cornerback CHARLES TILLMAN (defense) and Cleveland Browns kicker PHIL DAWSON (special teams). Wayne is one of the best route runners in the NFL. By properly identifying and reading defensive coverages, he can run away from man-to-man or find the holes and sit down against a zone. Whether in traffic or in space, the 12-year NFL veteran also is highly skilled in securing the ball safely and turning upfield after the catch. By being voted a captain, Wayne, Tillman and Dawson each will receive an equipment grant valued at $3,000 from USA Football to donate to the youth or high school football programs of their choice. USA Football is the official youth football development partner of the Colts, the NFL and each of the league’s other 31 teams. About USA Football: USA Football recommends national standards for America’s youth football community. As the sport’s national governing body in the United States, USA Football hosts dozens of football training events annually offering education for coaches, skill development for players and resources for youth football league commissioners. The independent non-profit is the official youth football development partner of the NFL and its 32 teams as well as the Atlantic Coast Conference. USA Football manages U.S. national teams within the sport for international competition and awards $1 million annually in equipment grants to youth and high school football programs based on merit and need. USA Football is chaired by former NFL team executive Carl Peterson.